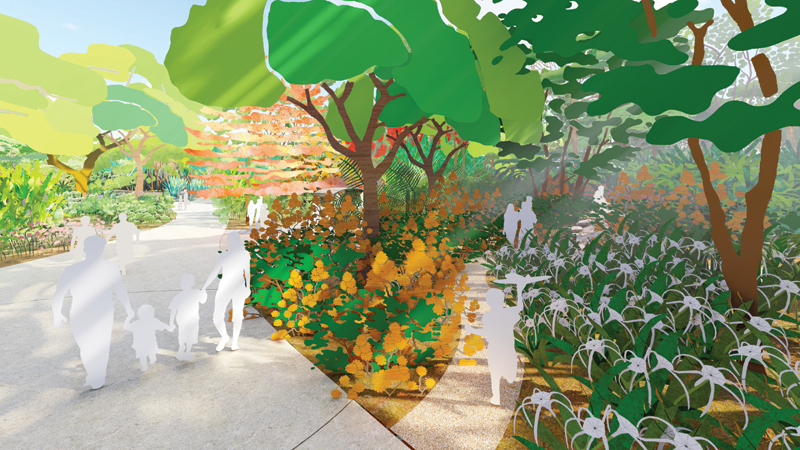 This rendering depicts the Global Collection Garden, one of four programmed areas slated for the Houston Botanic Garden’s first phase of development. Rendering courtesy west 8. In May, the Houston Botanic Garden unveiled plans for its first phase of development. The nonprofit organization, founded in 2002, is calling this inaugural construction “Botanic Beginnings.” It announced an opening in fall 2020. Designed by the New York and Rotterdam offices of landscape architecture firm West 8, the project is located along Sims Bayou just outside the 610 Loop southeast of downtown. Currently a golf course, the 120-acre site did not flood during Harvey. Fears of future inundation from possible catastrophic storm surges are being allayed by elevating the land. The first phase includes a “global collection garden” of tropical, subtropical, and arid horticulture; an “edible garden,” with shady groves for picnics and consumable plants; an event lawn and glade, for weddings as well as educational and arts programming; and the Susan Garver Children’s Discovery Garden — three acres of wild and wacky species, the sort of plants kids go nuts over. What caught Texas Architect’s eye were the renderings by West 8. This latest round of depictions is boldly abstract. According to Claire Agre, West 8’s design lead on the project, they were hand-drawn. In this era of photorealistic, computer-generated imaging, it’s refreshing to see a project communicated in a way that calls attention to its renderings’ artificial nature, while making the best of that nature. It’s not just that it’s honest about what it is, but that it weirdly invites the viewer deeper inside what the designers are attempting to create in real life. The people here are blank cutouts, which can be easily taken as stand-ins for you and your friends. The stock people pictures that architects often litter their renderings with can invite the wrong sort of ironical commentary from the cool kids in the room — an act of distancing. Abstraction is simply more open. It aims at producing a feeling in the observer, as opposed to accurately prefiguring form — a dubious endeavor, in any case, especially when the materials one is working with are primarily plants, which literally have lives of their own. What we get with this abstraction (and per the theme of this issue of TA) is — oddly, perhaps — a more transparent portrayal of what’s to come.